Many amateurs are very restricted with the space they have available for HF antennas. I have documented a short antenna for the HF bands, but here is a simple method of mounting it, and a method of further reducing the physical length. I used to use an old CB (27 MHz) half-wave antenna which had a broken matching coil. this I used as a 1/4 - wave antenna for 14 MHz, after removing the matching coil. Today I find that CB antennas have increased in price, so I have found a cheap replacement that can be fitted to the balcony of apartment dwellers. 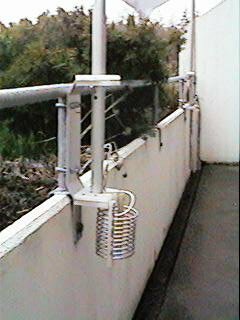 You may have already seen my HF Balcony Antenna which was designed solely for 14MHz, then a coil was added to cover all the lower HF bands (10, 7 and 3.5MHz). Following an article in RadCom I have now extended this antenna to cover all bands from 3.5MHz through to 30MHz without any switching or tuning. The antenna functions using both Fractal and Meander principles.